Passengers on Sydney ferries going to and from Circular Quay to Manly can now purchase beers from a 4 Pines Ferry Bar. 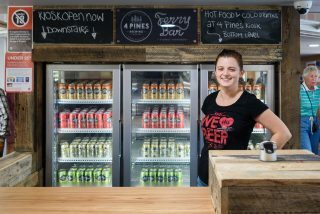 Harbour City Ferries awarded the bar contract to 4 Pines Brewing Company following a competitive tender. The brewer will offer a range of canned products as well as non-alcoholic beverages and food items on the four Manly ferries Narrabeen, Collaroy, Queenscliff and Freshwater, seven days week. The available 4 Pines beers include Indian Summer Ale, American Pale Ale, In Season IPA as well as Brookvale Union Ginger Beer. Food will be available throughout the day and 4 Pines beers will be available from 4 to 8pm and on some ferries from 4 to 9pm. “The move brings Sydney into line with ferry services around the world and Australia, offering a bar service,” managing director Martin Kearney said. “Sydney ferries are popular with tourists and I am certain the prospect of an iconic Australian beer such as 4 Pines will appeal to many of them. It’s just the latest move by Harbour City Ferries to improve the customer experience on our ferries. Extra security will be on board during the peak times of operation,” he said.